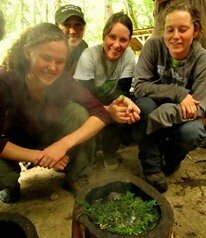 The Alderleaf Wilderness Certification Program has come to an end for another year. 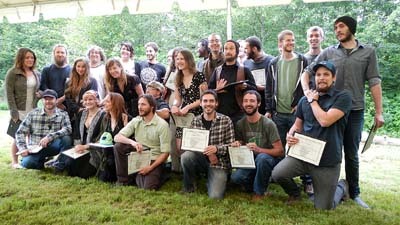 Students celebrated their success and learning journey at the graduation event on June 14. Before the day officially began, staff got together to make preparations for the celebration. 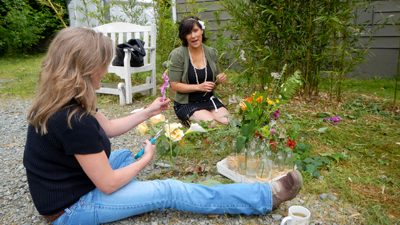 Here Georgie and Lori work on beautiful flower displays for the tables. Students arrived early to give their parents and friends tours around the property and to mingle with the staff. It was wonderful to meet all the people that have been helping our students to be here this year and who supported them from behind the scenes. Then students gathered when the ceremony officially began and stood together one last time before they dispersed into the world. It was a bittersweet moment for us, a mix of excitement and some sadness at seeing them leave. 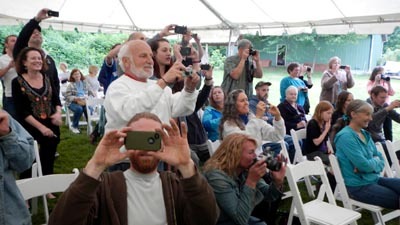 Below, proud parents, friends and loved ones snap photos of the students in the middle of the ceremony. During the ceremony the staff, apprentice instructors and students all shared stories and gratitude for the amazing time shared together this year. 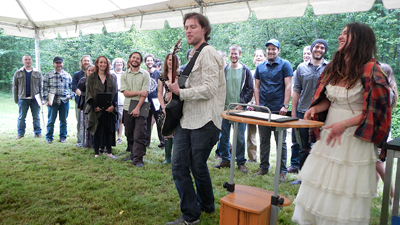 Here you can see students Rose and Sean leading a song inspired by the school year. All of us at Alderleaf are grateful to have shared this year with these amazing and beautiful people. We wish them a joyful continued journey of learning, growing and making a positive impact on the world!